We didn’t expect that so many of you will notice that small ad at the bottom of Christmas Eve’s newsletter inviting to take part in the competition 🙂 And so we were pleasantly surprised to receive so many replies. Title King of the Hosts goes to TCS with 3637 hosts carefully monitored by Zabbix. Title Master of the Triggers goes to TCS, as well, with 63471 triggers in use (maybe because hosts are connected to triggers :)). Title Lord of New Values Per Second goes to company Conf***, Inc., with the result of 919.85 new values. This time we don’t have second or third places, everyone is a winner here. 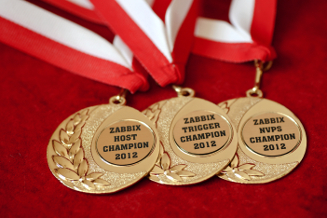 Thank you all who participated in this Zabbix Championship. We hope that this is not the last competition of this kind and we will see even more applications next time! Oh too late ! 1147,76 new values per sec here 😉 It will be for the next year ! Could you provide server configuration for such big rate?